Mr. Katz is a passionate performer of new music. He premiered and recorded Menachem Wiesenberg’s Cello Concerto with the Israel Defense Force Orchestra and has performed several American and Boston premieres of Elliott Carter’s music, working with the composer. He also worked with composers György Kurtág, John Corigliano, Leon Kirchner, and John Harbison in performing their music. 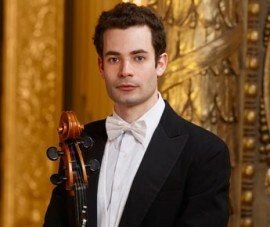 Following his success in performing new music as a fellow at the Tanglewood Music Center, he was invited back to Tanglewood in the summer of 2002 as a member of the New Fromm Players, an alumni ensemble in residence, performing challenging new works and collaborating with young composers. An active chamber musician, Mickey has performed in such venues Weill Hall at Carnegie Hall and Alice Tully Hall in New York, Jordan Hall in Boston, the Gallerie dell’Accademia in Venice, Italy, and Salle Gaveau in Paris, as well as all the major venues of Israel. He participated in the Marlboro Festival and was invited to take part in the Musicians from Marlboro tour. He has collaborated in performances with distinguished players such as violinists Pinkhas Zukerman and Gil Shaham, violists Tabea Zimmermann and Kim Kashkashian, members of the Juilliard and Guarneri string quartets, and pianist Gilbert Kalish. Mickey completed his mandatory military service in Israel as a part of the “Distinguished Musician Program”, playing in the Israel Defense Force String Quartet, a group that performs throughout the country both in classical concerts and in many outreach and educational concerts for soldiers and other audiences. He graduated from the New England Conservatory in Boston, where he was a Piatigorsky scholarship student of Laurence Lesser. His teachers included Paul Katz, Uzi Wiezel, Hillel Zori, and Uri Vardi. He teaches privately and is on the faculties of the Tanglewood Music Center and the Boston University Tanglewood Institute.